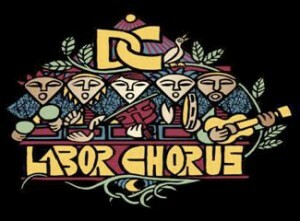 For the first time ever, two of DC’s premier singing groups, the DC Labor Chorus and Not What You Think, will join forces in solidarity for “Peace, Jobs and Justice,” a concert of their best songs! For tickets, click here! Singing in Solidarity! DC Labor Chorus & In Process… in Concert. Celebrating International Workers’ Day. Saturday, May 2 * 7:30 p.m. * First Trinity Lutheran Church, 501 4th St. NW, Washington, DC 20001. 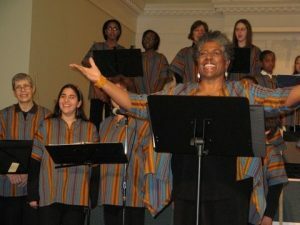 Join the DC Labor Chorus and women’s a cappella ensemble In Process… in a celebration of International Workers’ Day with songs to lift the spirits, including traditional labor and civil rights songs. Tickets are $20.00 if purchased at the door or from a choir member–If purchased on-line there is a $1.50 service fee for processing per ticket. 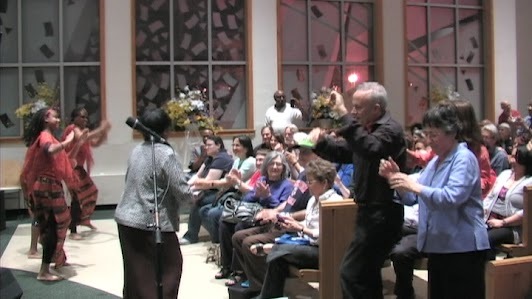 On December 1st, “Joyful Solidarity” was the theme this year as the voice of the DC area labor movement closed out 2013 with favorite songs (holiday and other) selected by various Chorus members, along with sacred songs from a range of faith and cultural traditions. The audience was also treated to our ever-popular medley of holiday carols … reworked to make you laugh out loud as you think about how we move through our communities and the world in which we live. There were two FREE concerts (at 3 and 7:30 pm) that day. The two show times gave people a chance to come before holiday festivities or after. We hope that the progressive music lovers who’ve made the DC Labor Chorus’s annual Winter concert one of their favorite holiday traditions enjoyed the concert! We hope to post some photos of this energizing day soon, so stay tuned. If you would like to support the chorus you can purchase their music from the Labor Heritage Foundation store by clicking here. Our Spring 2012 Concert was an amazing evening. While photographs can in no way do justice to the concert, we’ve created a gallery that gives a small taste of the evening. The DC Labor Chorus is a musical ensemble representing union members from the Washington, DC area. Some of us are professional musicians but most of us are union members and activists who just love to sing! The DC Labor Chorus sings for rallies, demonstrations, and picket lines. We welcome union members to the annual Great Labor Arts Exchange each summer, and we hold an annual “Sacred/Favorite Songs” concert every winter and a community benefit concert every spring. The DC Labor Chorus is a program/affiliate of the Labor Heritage Foundation, a 501(c) 3 non profit organization. Sopranos: Mary Best, Susan Clark, Jackie Fralley, Sonia Kassambara, Kathleen Sutcliffe, Pam Parker, Junette Pinkney, Allie Rosenblatt. Altos: Connie Cordovilla, Sari Finn, Lakeisha Harrison, Melanie Jones, Tyler Jones, Liz Krainman, Laura Larco, Lisa McGowan, Mkawasi Mcharo-Hall, Pam Larson,, Brianna Morgan, Karen Newman, Joy Nicholas, Robyn Robbins, Fran Owens. Tenors: Elise Bryant (Director), Emanuel Finn, Don Pelles, Warren Williams, Darryl! L.C. Moch, David Sands. Bass/Baritones: Ken Giles, Larry Katzman, Peter Jones, Steve Jones, Will Rice, Abelardo Sandoval, Fred Soloway, Fred Stollnitz.